But even that’s not the real problem with this war. The problem is that we’re fighting the wrong war to begin with. 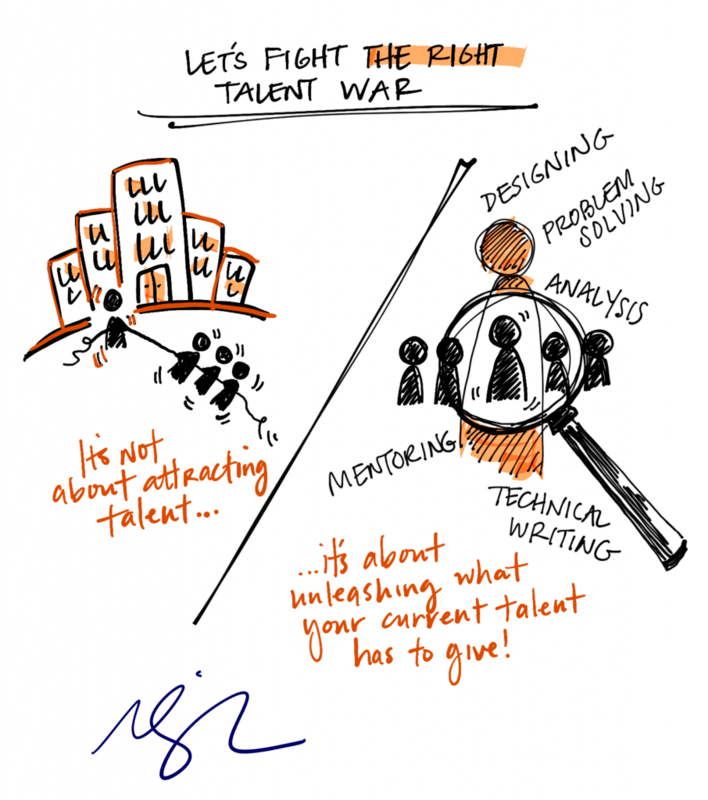 The “war for talent” is nothing more than tired, legacy HR jargon. If you ever want to trade in that Arsenal football for a Barcelona ball, come to Spain and we will give you a free gift. All the best with your movement. At TOVO Academy we are on a similar mission with respect to maximizing talent on and off the pitch. In part, this is the legacy of my father-in-law, Johan Cruyff. Be well on your path. Hope to catch up in person one day. Conversely, in a 2/16/17 NPR “Fresh Air” broadcast, actor Mahershala Ali speaks about the debilitation of a person forced to “folding in” on oneself from sheer disregard, hatred, ignorance, pettiness, lack of love, appreciation, and recognition of unique self, gifts, and talents. Of course, the countervailing forces are deep, pervasive, and selfish with symptoms that range from hiring then corralling to arrogance, complacency, possessiveness, and entitlement. Obviously, the practice of love and clarity requires the rare gift of unconditional love and charity.. .
Great stuff, Marcus! I’m in a role at Azusa Pacific University where I get to ask these kinds of questions as well as stimulate possible strategies for identifying and developing that talents and gifts of our students, faculty, and staff. Additionally, we believe that bringing out the best in people for the sake of service to the world is in God’s heart and design as well! Blessings to you and the work you do! It appears that today’s talents do not plan to stay for more than a few years with the same employer. Then a new challenge a new market a new geography. How to avoid to waste all the efforts made to coach train and grow them and to increase their willingness to stay for longer? I was about to comment on the fact that if you are a growing company then of course attracting must also be a priority. But then I read through what you were saying again, and, thinking about it, realized that we probably are all underestimating how much capacity is sitting wasted in our organisations. If we could actually unleash that capacity and fully engage every person, chances are we could stop recruiting whilst still growing revenues and profits for quite some time – and if it’s done through helping people find and really work in their strengths, then we will all have a much more enjoyable work life. Spot on Marcus! Most big corps still cant work out how to handle the much maligned Millennials (whio by the way are running , Google, Facebook Airbnb, Uber etc etc ).. Give them Voice, seek their inputs, don’t over manage and they just may turn out to have some great stuff to share and contribute. You are right – the talent is staring many orgs in the face – they just tend to ignore it or manage it out! Brilliant! I was recently overlooked for a promotion. They hired an outsider and told me I wasn’t what they were looking for. I thought, “then why didn’t you develop me into the person you needed me to be?”. I was open, willing, and engaged to do whatever it took to do the job and I had the qualifications. I also had high performance scores (4.3 out of 5). What a lost opportunity for me and the organization. Now I think “Should I bring my talents to a different organization that will recognize and develop me?”. BTW, I am in a highly regulated business and my qualifications are hard to come by so any organization that loses someone like me (and I am not saying this to be arrogant just factual) has lost a significant amount of qualifications.